Some women would rather die than kill an animal to steal its fur, but we can steal ideas from nature without harming anyone or anything. That’s normally called biomimetics but really it should be called bio-kleptics. People call it biomimetics because they want to pretend it isn’t stealing but ‘only copying’, as if nature shouldn’t be entitled to any intellectual property protection. Then again, imitation is a form of flattery, and we are ourselves part of nature, so maybe we have inheritance-based rights to copy whatever we see. So let’s not make a big deal of it. Fur is a great idea. Millions of long fine strands of material are extruded from the base to make a dense but very soft material that traps air to keep the animal warm, give some protection from sun and scratches by thorns, and make it harder to eat. If it’s dense enough, or coated with oil, also preventing water from getting through. If it looks right, it also makes the animal cute to humans, so they’re less likely to murder it and may even sponsor it as a pet, with free accommodation, medicare and food. So… carbon fur. Well, obviously it would be based either on nanotubes, or graphene strands, or some combo. Both can make long hollow fibres (aha! there’s their duvet and pillows sorted for a future blog) so are perfect to make fur. Conventional synthetic fur coat manufacturers have already got perfectly good techniques for making fur, so if I was lazy, I could just use them. But the Carbon Trio need something special. And they really are fond of nature, so we need some technique that allows the carbon skin to self organise into follicles and extrude fur filaments from there. And it just so happens, I made one earlier. Self-organisation is the sound basis of a huge multitude of natural phenomena. 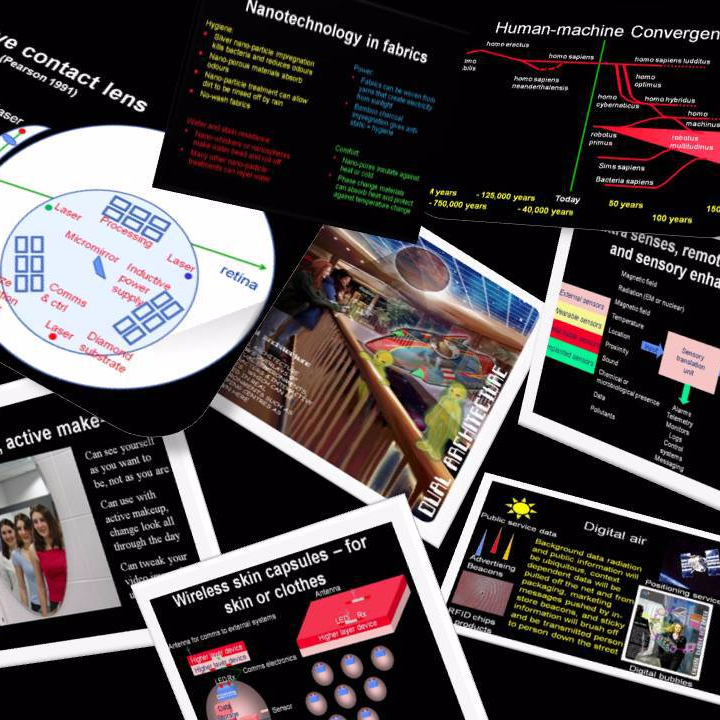 Even human life starts as a single cell, and after some divisions the cells have to start differentiating and self-organising into structures that become limbs or organs or whatever. When I was asked to study DNA as a computing basis in 1992, I got sidetracked when I was reading up on cell differentiation and realised that the same principle could be used to self organise electronic systems such as exchanges, chips, circuits and even processors. A few years later, another BT engineer, whose name I have sadly forgotten, adapted similar self-organisation principles involved in hair growth on a fruit fly’s abdomen to make a mechanism for self organising mobile phone networks. Both of us independently used nature’s idea of hormone gradients. It works well, both in nature and in engineering. Given nature’s other idea of membranes, and linking the two,very complex systems can be self organised. So that’s the basis of how carbon filaments in carbon fur arrange themselves so that they’re nicely spread out without having to manually place every single one. Each follicle would be a tiny graphene strand printer/extruder, and the follicles would self-organise using virtual hormone gradients and membranes. In practice these virtual hormone gradients can be magnetic or electric fields, chemical gradients, signal strengths or any other physical property that can be varied. Membranes can be digitally demarked by naming or use physical interference effects or barriers. Imagine a 3D printer with a head that is a packed array of carbon-atom-emitting tubes. It could be made with a nice hexagonal layout as in the picture above, simply by aligning many layers of graphene on top of each other. 6 carbon atoms in a hexagon just make room for a 7th to come through the centre. If that doesn’t work because it is too tight a fit, carbon nanotubes can be made to size to do the job. I’ve only drawn a small section of the head for simplicity. This diagram only shows the print face, not the 3D structure. In the diagram above, each vertex is a carbon atom. (The colours are only to clarify the diagram, the vertices that are shared are just one atom, not two). If carbon atoms are forced through the centres of the hexagons in the ‘bit pattern’ shown on the right, driven by a high frequency and perfectly phased signal, graphene would come out of the printer. Bear with me here. I haven’t got the diagram wrong. The trouble at first glance is that the distances between the centres obviously isn’t the same as the length of each side of the hexagon, so the hexagonal pattern of atoms streaming out won’t be the same dimension as the graphene used to make the print head. That isn’t a problem here. With this technique, it would not be able to make large continuous sheets of graphene, but by phasing the emissions of each pipe, what it could do is to produce thin strands of graphene, and a range of widths of strand would be feasible. The phasing is all-important, as it would drive the production of the strand around the print head as it emerges.The carbon atoms would converge and bond as they emerge if the ionisation and phasing is correct. Phasing would need waves of EM field to pass through the graphene, originating from transmitters on the circumference. Ionisation of the carbon atoms would be before they enter the tubes, and although they would be sucked into the tubes in a continuous stream, their bit pattern emerges as they are spread out selectively by the fields acting on them. As I said, phasing is all important. 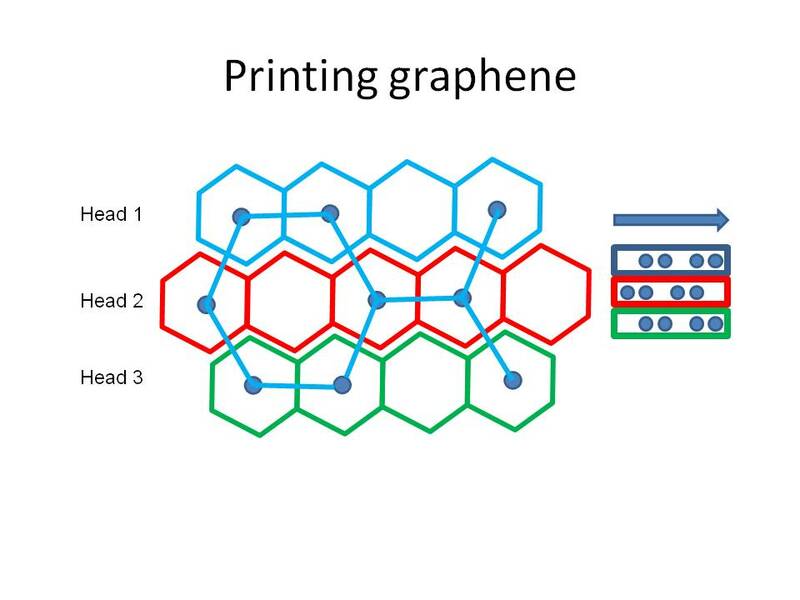 Each print head would produce one strand of graphene. The strand would be very fine. With clusters of these print heads extruding strands of graphene, you would get graphene fur. Rubbish if you want sheet, but great if you want fur. So there we are. Just as Post-it glue was accidentally found while trying to design something else, poor design for a graphene sheet printer turns out to be just what we need to make carbon fur. Spacing the print heads to the required pattern, any density of carbon fur is possible from sparse to dense. The fur filaments would emerge from the graphene layers that make up the print heads, and these would not be continuous, but attached to an under-layer in patches so that they can stay in place. Using a different attachment pattern for each layer of print head allows great strength and maintains alignment. This under-layer provides the solid foundation and material strength. It could use combinations of graphene, nanotubes and mostly carbon fibre, together with the fur itself. OK, it looks OK in theory, even if I haven’t bothered explaining every detail, but this would be difficult to do, so puts this kind of technology a bit further in the future than a lot of other carbon products. Carbon fur also makes good protection and insulation. Biomimetic fabrics and carbon fur will feature in some later blogs too. And the printer here is capable of very fine print, and very intricate 3D printing, so it will feature too, eventually.